Harmony Cubes are lightweight 3D wall panels that work together through an automatic pattern repeat to create large-scale dimensional walls of any size and shape. Wall panels work in multiples to create a continuous, uninterrupted dimensional sculptural wall. You can cover an existing wall with wall tiles or disguise wallpaper or paneled wall. These modern wall tiles create a sculptural and continuous dimensional surface to any room setting through patterning. 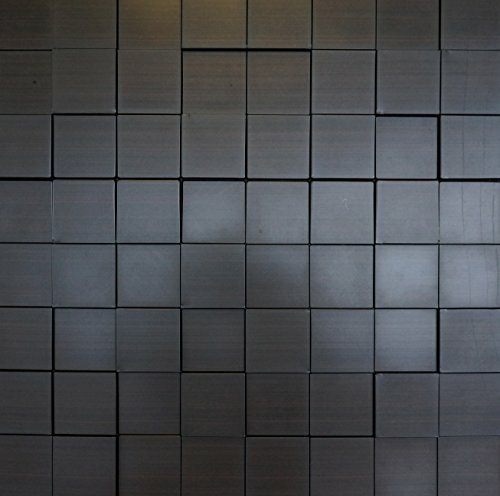 Harmony Cubes tile creates a modern seamless pattern on a feature wall or art piece. Installation: Glue up wall panel with construction adhesive (recommended to use "Locktite PL Premium"). Tile Dimensions: 2' x 2' / 24" x 24" (approximately 4 square feet of coverage per tile). Material: Thick thermoplastic PVC tile. Cleaning: Easily with a damp cloth. The decorative thermoplastic panels with MODERN 3-dimensional square bricks design with a luxury, fresh, young feeling that will UPGRADE and FRESHEN UP the room even when applied to a small area by creating a beautiful accent wall. They create a stylish accent and revitalize any interior within a very short time and simplified preparation. CONTINUAL and FLOWING 3D wall decor textures inspired by classic building materials, while achieving SEAMLESS APPEARANCE through INTERLOCKING DESIGN. Size: 2' x 2' (24'' x 24") covering approximately 4 square feet; SUPER DURABLE: high quality thick PVC thermoplastic panel. No need for filling nail-holes, chips, cracks, smoothing the surface or sealing with a primer - use the panels to create the right atmosphere using only an adhesive. Recommended use: 3D wall design suitable for residential BEDROOMS, KITCHENS and LIVING rooms, as well as PUBLIC SPACES such as restaurants, reception areas and more. Easy to install and dismantle (DIY), aesthetic, paintable, light weight, flexible, fire rated ASTM EL84 | EN 13823, water and impact resistant and maintenance free. The lightweight panels are extremely easy to handle and transport, making design projects easy to carry out in a very short time. If you have any questions about this product by Retro Art, contact us by completing and submitting the form below. If you are looking for a specif part number, please include it with your message.